First, the absurd. My wall was painted red by the saffrons. 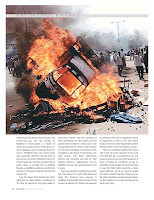 They were writhing in anger against the injustice done to Narendra Modi, the chief minister of Gujarat. Wait, I am not referring to the walls of the house I live in, but the one of my profile of that ubiquitous social networking site called Facebook that has come to define us more than what our real existence does. So, the saffrons had painted my, and almost anyone else’s who had something to do with India, red. They had detected, invented would be the correct word though, a conspiracy against Mr. Modi as well. Ah, the man and his almost paranoid love for conspiracy. Such a penchant Mr. Modi has for conspiracies. I remember, with horror, the ones he has already exhausted. Having done to death part accusations part abuses like pseudo-secular, pseudo-intellectual, pseudo-liberal, Pakistani/Muslim, Italian/Christian and the likes , he would soon have to invent new ones, I am afraid. The spin- master he is, he may turn even that into propaganda for his vibrant Gujarat by declaring it the new Mecca, nay the New Ayodhya, for the linguists tasked with inventing new words that could ‘qualify’ conspiracy. So the social media, right from Facebook to Twitter was put on fire by his over-zealous supporters over his ‘dethronement’ from the top position in an online poll for choosing hundred ‘most influential people’ that was being conducted by the Time, a reputed American news magazine. 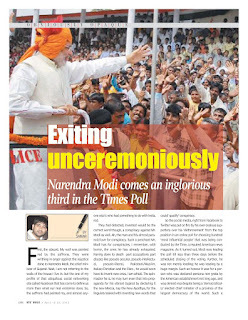 As it turned out, Modi was leading the poll till less than three days before the scheduled closing of the voting. Further, he was not merely leading; he was leading by a huge margin. Such an honour it was for a person who was declared persona non grata by the American establishment not long ago, and was denied visa despite being a ‘democratically’ elected chief minister of a province of the largest democracy of the word. Such a restoration of dignity it was to the persona of someone believed to be a mass murderer in disguise, wasn’t it? He was leading the negative vote with an equally huge margin as well, though his supporters shied away from talking about that. They, instead, chose to beat the seventy per cent in favour against merely thirty per cent in opposition as the definitive and decisive evidence for the support their leader enjoys. They had drawn the first blood and nothing could stop them from setting propaganda machine in motion, all cylinders firing. The victory needed to be celebrated, and celebrated full on, for it was a victory of not merely a person but of all of Gujarat and its seventy million people. They had started placing orders for everything that could be used in celebrations. 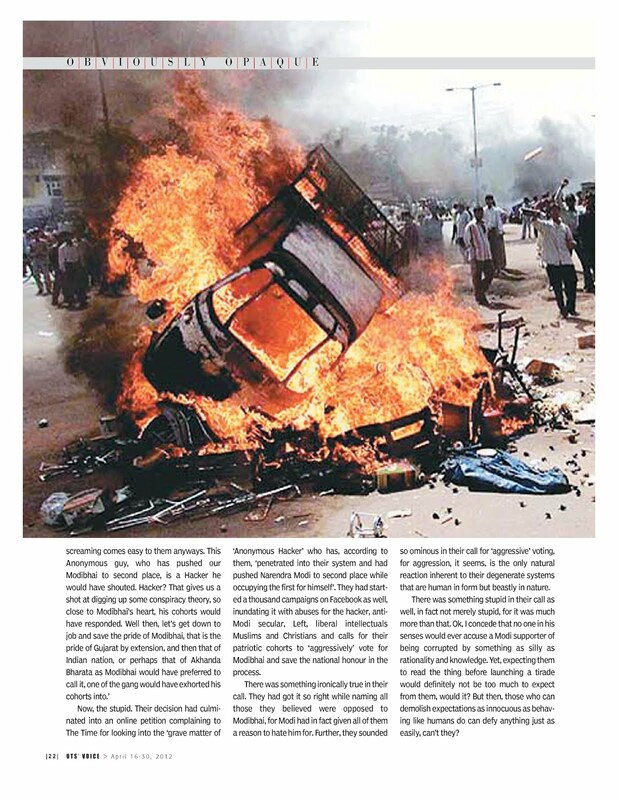 Gujarat, too, was bracing up for surviving the assault of the brigade, telling itself that no new king size cutouts could kill aesthetics more than the old ones, and that full page newspaper advertisements have already touched the ebb and that they could not go worse than what they already were. Then came the avalanche. Master divider was pushed, unceremoniously, to the second place by the penultimate day of voting. Not only this, the votes against him were going up slowly but steadily. The number of ‘never, no way’ sayers had reached precariously, of course only for the zealots vouching for Modi, close to those far him. The dream run was going to be over, or was it already? The high hopes of making it big on the cover of the Time seemed to be running out of steam. But then, the bigots were not going to take it lying down, were they? They were working overtime, too, all for finding an excuse that could explain the failure or a hole that could puncture the balloon. How much they wanted something which could save the day for them. Now , the stupid. Their decision had culminated into an online petition complaining to The Time for looking into the ‘grave matter of ‘Anonymous Hacker’ who has, according to them, ‘penetrated into their system and had pushed Narendra Modi to second place while occupying the first for himself’. They had started a thousand campaigns on Facebook as well, inundating it with abuses for the hacker, anti-Modi secular, Left, liberal intellectuals Muslims and Christians and calls for their patriotic cohorts to ‘aggressively’ vote for Modibhai and save the national honour in the process. There was something ironically true in their call. They had got it so right while naming all those they believed were opposed to Modibhai, for Modi had in fact given all of them a reason to hate him for. Further, they sounded so ominous in their call for ‘aggressive’ voting, for aggression, it seems, is the only natural reaction inherent to their degenerate systems that are human in form but beastly in nature. There was something stupid in their call as well, in fact not merely stupid, for it was much more than that. Ok, I concede that no one in his senses would ever accuse a Modi supporter of being corrupted by something as silly as rationality and knowledge. Yet, expecting them to read the thing before launching a tirade would definitely not be too much to expect from them, would it? But then, those who can demolish expectations as innocuous as behaving like humans do can defy anything just as easily, can’t they? As it came out, they had not bothered to read the description of ‘Anonymous’ as offered by The Time, forget checking it anywhere else. They confused the world-wide group of Anonymous ethical hackers that has proved to be resilient enough to be up and kicking despite an across the world crack down on them with some anonymous hacker operating out of his cubicle to manufacture money out of his malwares. If only they were following even The Time, they would have known that the term Anonymous has assumed an aura of righteousness, not the pretended one of their sort, but one that denotes the resolute participation of the common person on struggles that started in the Arab Street and ran through the Wall street, engulfing all the dictatorships that fell in between. If only they had known that this Anonymous was not the anonymous that specialized in the art of hiding himself behind a saffron mask for killing and maiming citizens as they did in Gujarat in that fateful summer of 2002. No, this Anonymous is the one that has kept that space of resistance on the internet up despite regular arrests of its key members in a pan-European witch-hunt much in the same way as the Anonymous citizens who bore the brunt of the first round of army fire to give birth to democracies out of US supported dictatorships. But then, as I said earlier, can one really expect reason from those who rejoice in killing hapless people? Can one expect calls of harmony and peace from those who refuse to wear a Muslim skull-cap even while flaunting all others in their ‘Sadbhavana’ fasts? Can we expect an attempt of reconciliation from a Chief Minister who was accused of not following the ‘RajaDharma’ by the Prime Minister of the country belonging to his own party? But can we expect this person to win the race of being most influential person of the world, even if the race does not mean much in itself? Not really, for the blood that they spilt in Gujarat is too thick to be forgotten by even those who claim to be friends of the murderer. No one has forgotten how Nitish Kumar, Chief Minister of Bihar and a senior leader of National Democratic Alliance, has shooed Narendra Modi away threatening his Bhartiya Janta Party to break the alliance if they bring Modi in for canvassing in Bihar. Can we really forget how stubbornly had he refused to share dais with this sectarian leader? Forget all this, for even the BJP’s own unit of Uttar Pradesh did not let him canvass there during the assembly elections fearing all the negativity it will cause. 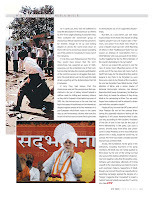 Narendra Modi is also just one, according to Nitin Gadakri, President of the BJP, of tens in the race for the post of Prime Ministership in the party. Can such a person, shooed away from Bihar and unwelcome in Uttar Pradesh, be the most influential person even in India, forget the world? No, he cannot. The Time had made a mistake and the Anonymous corrected that. And lastly, the humiliation. 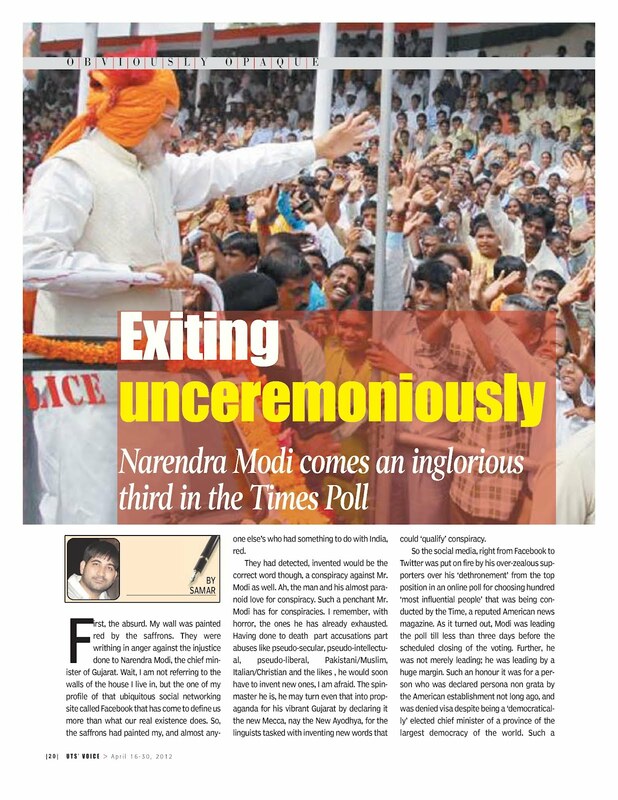 To the grins of his detractors, including two-third of his party members, Mr Modi was not merely pushed to third place by the end of the voting but had also secured the dubious distinction of garnering more negative votes than the positive ones. Perhaps such shameless attempts of forcing oneself in the international arena are fated to end in such exemplary failures. 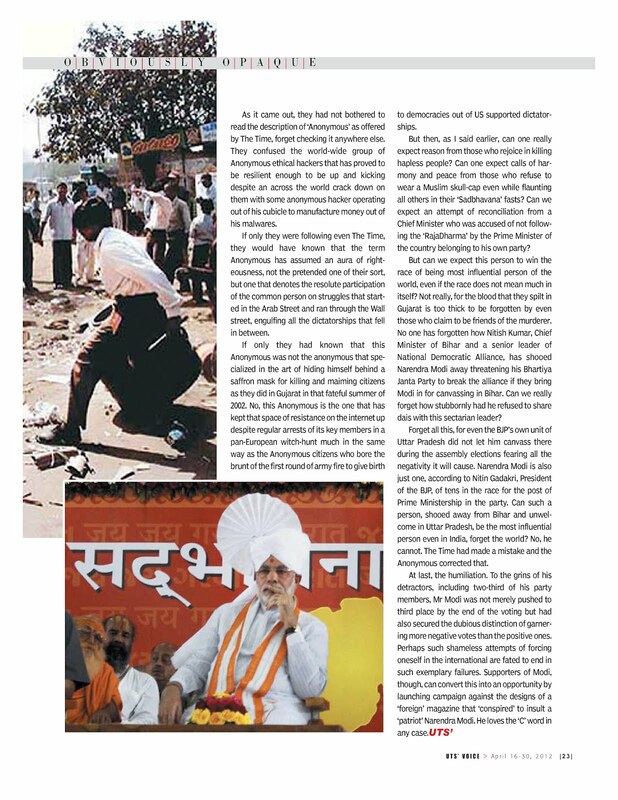 Supporters of Modi, though, can convert this into an opportunity by launching campaign against the designs of a ‘foreign’ magazine that ‘conspired’ to insult a ‘patriot’ Narendra Modi. He loves the ‘C’ word in any case.